During the event period, take in-game screenshots and submit it in the 「Fan Art Bulletin Board」. This time’s theme is 「Rumble Vacation」! The Management Team will select the Excellence Awards among the submitted works. ※ The User Interface (UI) can be hidden by pressing the 「Scroll Lock」 key. Please use it if you wish to hide your character name, etc. when taking screenshots. Please submit your work in the official website’s 「Fan Art Bulletin Board」, with the title-prefix of 【イベント】. For the submitted content, please submit a screenshot associated with the Grace City Stage or the Rumble Vacation Maze. You are free to write whatever you like in the message description. ※ If there is no 【イベント】 mentioned in the title, it will be excluded from the event. ※ There is no Participation Award in this event. ※ You cannot win more than once by submitting under the same character; however, you can win more than once by submitting under a different character in the same account. ・ You need to create at least 1 character in the game to participate in this event. ・ Entries are only limited for original, unpublished works. 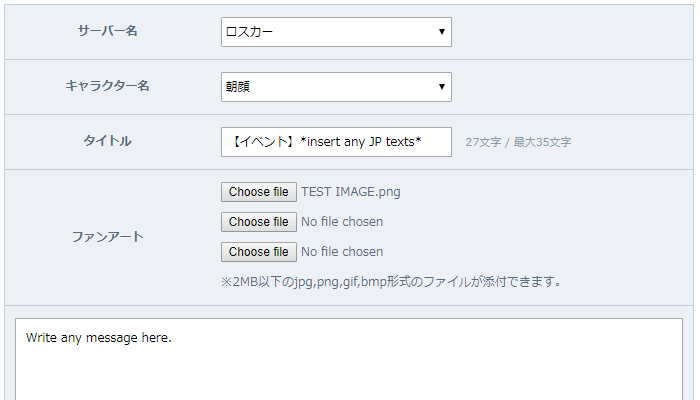 ・ Submitted works that does not conform to the theme may be excluded from the event.